Who trusts the government with their details? The headlines in virtually all of the national UK papers today were stark. "Darlings ID Crisis as 25m names lost" said the Sun (actually "Keeley's such a hot date" was also there). Nevertheless, what has happened is that an official at HMCE (Her Majesty's Customs and Excise) posted in the normal post, 2 unencrypted CDs containing the data of all parents claiming child benefits, the childrens' names, the addresses and the bank account details of them all. These CDs have gone missing. The risk is that criminal can use this data to engage in widespread identity theft and bank fraud, ordering credit cards in the names of others. Not to mention the risk to personal privacy. The information had been posted to the National Audit Office which didn't actually request all that data. It simply wanted a sample of child benefit claimants and then only names, National insurance numbers and child benefit numbers - HMCE decided it was too hard to filter out the data so posted the lot. The low level official to blame is now under 24 hour watch in a hotel under a different name to avoid being pursued by criminal gangs eager to get the data. The story is covered in detail on all major paper websites, but what i've read so far has been from The Times in several articles. Now one way of looking at this is - well if you're going to claim child benefit then the government takes this much data in exchange. Lower taxes don't need the government to hold all those details at all. However, what this really demonstrates is the sheer incompetency of the state in managing huge amounts of private and sensitive data. It obviously raises questions as to whether it could ever cope with a National ID card scheme and ensure the confidentiality of any data. For starters, the data sought was not what was supplied. It was "too burdensome" to supply the smaller amount of data, demonstrating the incentives to get this right simply aren't there. HMCE wanted to ensure it did minimum work, so sent far more than it needed to two. Secondly, the mistake in posting this information, in an unencrypted format also demonstrates the lack of incentives to get this right. Imagine a bank doing this? Imagine how much business it would lose from being so incompetent? The difference is the state has a monopoly, you can't say no (although as I said you could say no to child benefits, but it's not as if you'll get tax back from doing so). Finally, there is lack of honesty about this. It didn't happen yesterday, or last week. It happened months ago - the efforts to find the CDs have been fruitless, so now the banks have been advised, and the public too. It is not a Labour or Tory issue, it is an issue about government, and the simple fact that there are never the adequate incentives or accountability for when the government fails to protect its citizens. This is one very good reason why governments should do less, nor more. So Ken has swanned over using his increased council tax take for a trip to India - and he has the gall to go on about climate change. His latest "great idea", reported on BBC London TV news is to ban airlines flying between London and Paris, and London and Brussels because "you'd be mad" to fly now that the high speed rail link has been opened. Like any budding petty dictator, Livingstone wants to ban the flights. Of course for starters he hasn't the power to do this, so he's talking out of his arse about "wanting to do it". However, secondly he is wrong. You're not necessarily mad to fly instead of catching the train. For starters, some people live or work closer to the airports than the railway stations. Heathrow may be a lot more convenient for some west of London than finding your way by rail to St. Pancras. London City Airport is more convenient for some as well. More importantly, one very good reason both BA and Air France fly London-Paris is that the airlines pick up passengers to feed onto long haul flights. You can fly quite cheaply from London-Paris-Africa or Asia for example. However, like many politicians (it isn't just the left) Ken automatically knows what best about something he really knows little about. Thirdly, what would be the effect of "banning flights"? The price of rail travel would increase, dramatically. It would be a monopoly, then the drones and complaints about the privately run railway ripping people off would also come from Ken. Airlines add competitive pressure, something that Ken has shown no interest in with his London transport policy. Finally, his own idea fails to reflect that the market itself is already delivering part of what he says. BMI stopped flying London-Paris two years ago because of the competition from Eurostar rail services, Easyjet and Ryanair have also abandoned such routes after having a go at them. Air France has reduced its schedule because it gets higher value from selling those precious Heathrow landing rights to its airline partners like Delta and Continental, than keeping them for this route. Flights between London and Paris/Brussels have been in decline for a few years, this is likely to accelerate - for good economically rational reasons. People are responding to their best interests, and airlines are responding to this - none need Ken to push them around. I recently has cause to fly to China from London, as BA was charging an extortionate fare for the direct business class flight, and I wont fly Air China for reasons I shouldn't have to explain, and I can always do with some Star Alliance points, I chose Austrian Airlines - which means obviously, flying through Vienna. 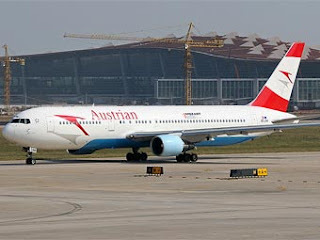 Austrian has a good reputation for long haul service, and I also read that Vienna airport is a breeze to transit through and Austrian waits for connecting flights - so why not? Well first, what was good? Vienna IS a breeze to transit, when returning it was literally out one gate and there's the next one less than a minute away. Even arriving from London when we had to be bussed in the rain from the tarmac (grrr), the walk from the entrance point to the gate took 2-3 minutes. No further than going from checkin at Wellington to the Air NZ gates. Light years ahead of the rabbit warren of Frankfurt. Secondly is the food. Austrian Airlines has a dedicated onboard chef in business class on long haul. Yes a chef, not a trolley dolly heating up pre-packed food in ovens, but actual cooking. The starter is an antipasto trolley with around 12! - yes 12 different starters, hot and cold, and soup to choose from. The dessert, fruit and cheese trolley isn't much different - with a wide range available. The mains is cooked as you like it, so steak can be rare, medium or well done. You order breakfast with eggs how you want them! This wasn't done on a 747 either, it was a 767! However Austrian 767s are far nicer than Qantas and Air NZ ones, it also has brand new 777s. Austrian uses a good part of the front to put in the galley. It also offers 10 different varieties of coffee, and an ample selection of liquor. Seriously, Austrian Airlines offered the best long haul airline food I have ever had, and makes you realise how second rate heat and eat food can be. This SHOULD be the standard for business class food. Even the short hops to and from London had high quality hot meals that were quite delicious. Thirdly is the service. The crew are willing to please, helpful, friendly, and respond quickly to calls and accurately, and are very keen to be perfectionists. Indeed, easily the best service of any continental airlines I have flown. Tall, multi-lingual, good looking, friendly, light years ahead of the moody trolley tarts for Virgin (and none of them can remember when they were) Atlantic. The strange orange uniforms don't complete put your off, and the chef wears a chef outfit as part of the deal. You get an amenity kit, which is fairly conventional and handy, and a decent blanket, but small pillow. 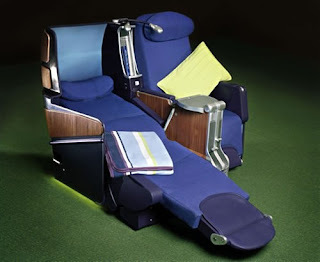 The longhaul business class seats. They are of the sloping flat variety seen in business class on Qantas, Lufthansa, Cathay Pacific and most Singapore Airlines flights. In other words, when you fully recline, it feels like you're lying on an ironing board which is leaning. The seats are also rather narrow. You see on the 767 the seating goes 2-2-2, whereas in economy class it is 2-3-2. The width of one economy class seats really only adds enough to cover the consoles between the business class seats. The good side is they are infinitely adjustable and have an excellent massage function, I got about 4-5 hours sleep on the overnight leg, so they are ok - and certainly light years ahead of any old fashioned recliners. There is some useful storage places in the seat, but it could simply do with being wider and properly flat. The inflight entertainment. Essentially it is like the old Air NZ business class multi-track entertainment system with slightly bigger screens (sort of like the Air NZ economy class ones in size). Not interactive, but quite a few channels. OK, but needing replacement. The lounge in Vienna. Frankly, this was crap. The business class lounge is pokey, has a small bathroom, no showers (which are highly desirable after a 9 hour flight), and a selection of snacks and drinks that are mediocre at best (Koru Club in Wellington is light years ahead). Free wifi is welcome, but a distinct lack of comfortable seating - and at certain times (and my flight to London was delayed over an hour and a half) people struggled to find seats. Finally, the business class seats on the European route were complete crap. I'm used to this, but these literally were just economy class seats with the middle seat blocked out on the A320 Airbus, but on the smaller jet there wasn't even that. Business class within Europe gave me a hot meal and first off the plane, otherwise I could've been flying Trans Tasman on Air NZ economy class and been more comfortable. So the conclusion? Fly Austrian if the food and service matter first, as both are good, and despite the poor quality lounge in Vienna it is still light years ahead of almost all United Airlines lounges. The long haul seats are alright, better than other sloping flat seats I've been in - but you can't beat true lie flat. The entertainment system is ok, no better than that which most BA and Qantas planes have, and Vienna is easy to transit - if you don't have the pain of waiting for your flight. The food and service are worth trying, and despite being part of the Lufthansa group of airlines, Austrian is well ahead of Lufthansa in every respect. It is a pity it has stopped flying to Australia! Winston's back from the "Workers' Paradise" and while I give him kudos for raising human rights, I do seriously wonder what good he has done. Will he incentivise North Korea to move forward, do these contacts plant seeds in the minds of high ranking officials and politicians that the outside world isn't so scary? You see these are the only positive things that could come of this - that eventually Kim Jong Il will die/be toppled, and those who work as part of this nightmare system will want help. The significance of Winston's visit isn't just about New Zealand reaching out to North Korea, according to Stuff it is the FIRST Western Ministerial visit since North Korea tested a nuclear weapon. Oh, the irony that the nuclear-phobic New Zealand is first to send a Minister to a totalitarian nuclear proliferator. Honestly, how does he know this? North Korea is a habitual liar, as anyone who spends time reading its press releases should know. What is "good progress"? How will anyone ever be able to verify that it has destroyed its nuclear arsenal, or dismantled all of its nuclear facilities? Seriously, how can you trust a totalitarian dictatorship that remains in denial that it started the war in 1950, that doesn't tell its population that men have landed on the moon and that claims South Korea is a starving chaotic hellhole of dictatorship and despair (yes the irony!). North Korea lied about pursuing a nuclear weaponry programme for many years, denied it wanted them - then "boom". North Korea is committed to convincing the rest of the world to bail out its bankrupt economy from its bankrupt system - that is what is wants - and it blackmailed the world into doing so. 'His visit included stops at a garment factory and farm, but Mr Peters was cautious about giving an overall assessment of life in a country few foreigners are permitted to visit, "I don't like to give my impressions after only three days. I came with certain impressions from my reading of background information. It is clearly a society that is unusual in most respects with the freedom of movement and information, but I saw glimmers of enough change to believe that we could be seeing a change going on here." I would have thought the impressions are obvious. Unusual is a great euphemism for totalitarian control. However glimmers of change are curious. There have been glimmers of change for years, but there have always been children incarcerated, tortured and enslaved in gulags. It should have been made clear to North Korea that this is unacceptable - New Zealand has penalised Zimbabwe, Fiji, Burma and South Africa for far far less than this. Why change now? Meanwhile North Korea reports on Winston leaving with a casual statement of fact . We shall wait to see if it makes any serious propaganda about his trip. Dr Cindy Kiro - Children's Commissar (which is a title she will continue to get from me as long as she seeks Orwellian monitoring and surveillance of all families) is, according to Stuff, concerned about a "wall of silence" surrounding child abuse. She cites a rather disconcerting example of a girl of 11 who became pregnant and gave birth at age 12. It isn't clear what has happened in this case, but the girl is not naming the father, and the whole family denies any knowledge. There are two likely explanations for her early pregnancy. Either someone older, influential and threatening within the extended family has effectively raped her (and she is too scared to point the finger because she wont be supported by her family), or she has had a boyfriend - transitory or otherwise - and they did what some adolescents do, without protection, and she is protecting him from prosecution. The family silence is far less likely in the latter category, unless she was often away from home and what she got up to was not monitored or even noticed by the family. Dr. Kiro is betting it's the former because of the wall of silence. Now the concern being shown is laudable, but what does disturb me is how Dr. Kiro paints a broadbrush over everyone with her statements. She makes it everyone's responsibility. 1. Up until today, people DID tolerate child abuse. This of course will be remarkable news to the vast majority of parents and adults who are appalled by anyone who abuses children. It is counter-intuitive for almost all adults to inflict harm or hurt children. It's not news, it has been a publicly expressed serious concern for at least a generation, and even before that there is little doubt that most people never tolerated child abuse, for as long as the concept of "children" has really existed in Western civilisation (which really does only go back to the early 19th century). 2. There is consensus that EVERYONE has to take responsibility for the abuse and neglect of children. Not just those who commit it, but you who don't. Where did she get this from? Of course if anyone I knew was abusing a child, it would concern me and I would be likely to take steps to intervene - quite simply I couldn't tolerate it. However, the state can't legislate for this, you can't make people talk, and all you can do is have particularly high standards for those cohabiting with children. A mother who repeatedly stands by while her child is abused by another is effectively an accessory to the crime and is grossly negligent by not protecting the child. In such cases, custody should be removed from her. Dr Kiro also said that "New Zealanders had to change their attitudes and behaviour to become more child-focused." Well hold on, most parents do this. Most children are raised in abuse free, loving households. There is a small minority who abuse, and the appropriate response is for the criminal justice system to punish those who do, to protect the victims and to deny welfare (and if necessary custody) from those who commit these offences. Underlying all this is, of course, a serious point. There are families which are large, and not so linked by relations as relationships, and in those circumstances it is convenient/lazy for the real parents to let others perform functions "in loco parentis". In other words, many adults have access to the children. Because the children are being watched over by a whole group, it means no two people are paying inordinate attention towards them, providing an opportunity for abuse through fear to be carried out. The rewards of having many adult role models (although sometimes a lot of those are questionable at best) are outweighed by not having two solid ones who protect, provide and monitor those kids. Indeed such large extended families risk there being nobody a child can turn to, because some bonds between adults are greater than those where families are not so closely interlinked. Children need adults they can turn to, trust and who wont respond erratically if they need to tell them something scary or awful - like how a relative, teacher or family friend has threatened them or sexually abused them. It's clear who Dr. Kiro needs to aim her message at, it is those who share the family raising among many adults. In short, the parents need to watch - and be their children's first defence, AND be prepared to turn against any close relatives who may be abusing their kids. The problem is, clearly, disproportionately Maori. Something else Dr. Kiro wont say. Like I have said before, why not completely deny welfare benefits from anyone who is convicted of brutality or gross negligence against a child? Or indeed, how about denying welfare from anyone convicted of a serious violent or sexual offence (something above common assault or indecent exposure). Permanently. Stop forcing other New Zealanders to pay for those who are violent to survive. Granted, it would save little money, but it would make an important point. and you can watch the socialists whine and defend violent criminals' right to welfare, because they might do it again - so because they will hurt you, you have to be forced to pay for them to live? Why don’t they condemn it, if it were true? Peace loving people of the Tuhoe "peace movement"
Trust NZPA to give you the "facts"
Liberal democracy under further attack? King Carlos tells Chavez to "shut up"